One way Evergreen boosts the local economy is through the entrepreneurial spirit of our foodie alumni. A stroll through downtown Olympia will take you past several Greener-owned food and drink establishments, many of which are award-winning and iconic. “The Olympia area is quickly becoming recognized for its culinary scene, drawing visitors from all over. 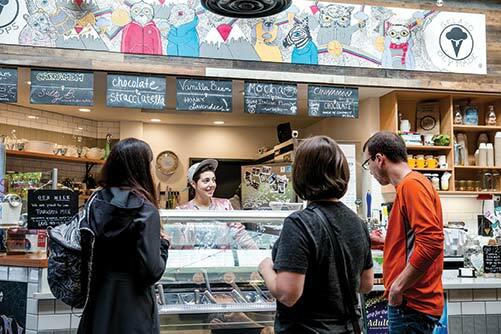 These local foodie hot spots are tapping into visitors’ desire to experience a sense of place through its food,” said Shauna Stewart, MPA ’10, CEO of Experience Olympia & Beyond. 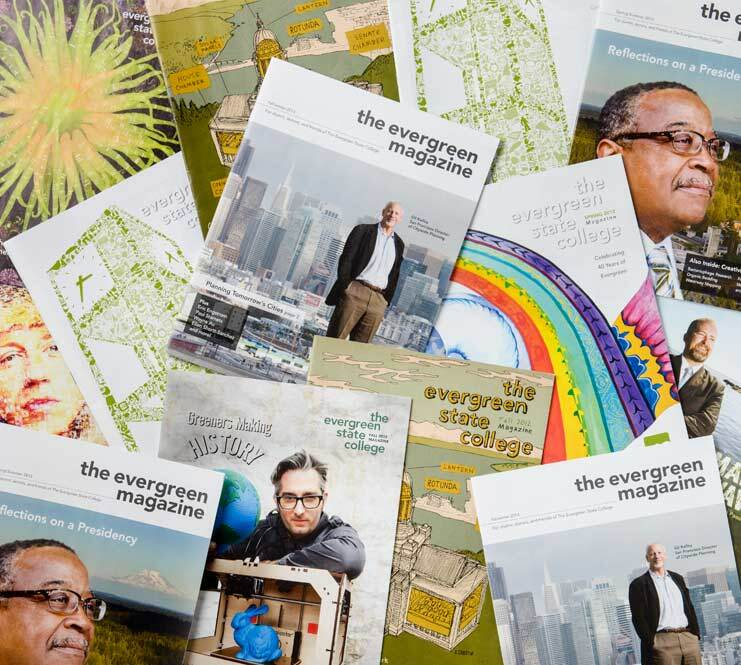 Sink your teeth into the next few pages to find out what some Evergreen alumni are serving up. Top 20 Winner, Western Washington’s Best Trendy Bars and Best Cocktails - The Evening Best of Western Washington 2015. South Sound Magazine talks about Dillinger’s Ritz Cocktail: Cognac, triple sec, lemon, maraschino liqueur, topped with sparkling wine and served in a champagne flute. 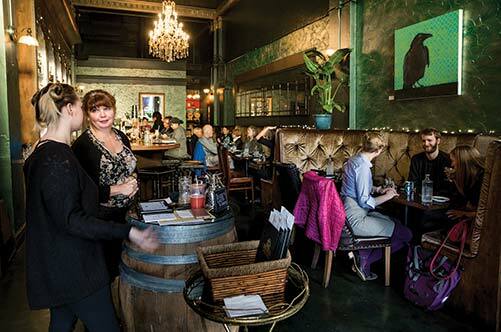 Dillinger’s was also a hit in an Olympia- focused Food & Wine Magazine feature. Also mentioned in Food & Wine was Sofie’s Scoops, owned by Sophia Landis ’15. Sofie’s uses gelato made from local milk pasteurized on site. Part of the 222 Market on Capitol Way (designed by architect Roussa Cassel ’05). Sofie’s serves at local events, including Evergreen’s 2018 Return to Evergreen. 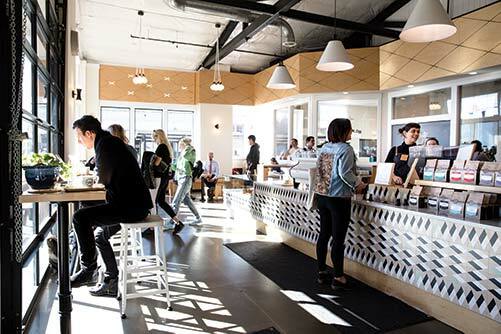 “Olympia’s new  artisan food market puts the capital city on the culinary map” – Seattle Magazine. Three Magnets Brewing Co. Sara ’01 and Nate Reilly ’01, experienced a flurry of fame in 2013 when their former breakfast café, Darby’s (now The Magnet as part of the larger pub location on Franklin Street), was featured on Food Network’s “Diners, Drive-Ins, and Dives.” Three Magnets continues to attract visitors and win awards for their signature craft beer and food. 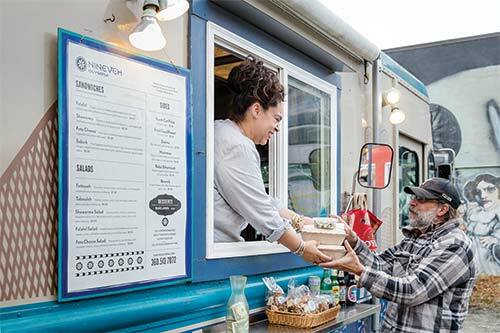 Nineveh co-owner Lisa David ’01 owns two businesses that Olympians (and Food & Wine Magazine) love: Filling Station Espresso and Nineveh Assyrian Food Truck, right next to the Teeny Tiny Taproom. Nineveh is self-described as a “destination for authentic Assyrian cuisine inspired by our ancestry and prepared fresh with care.” David has also been a special guest on “Assyrian Kitchen,” a Chicago-based cooking show. Olympia Coffee Roasting Co. co-owners Sam Schroeder ’04 and former Evergreen student Oliver Stormshak. The business recently expanded to Tacoma and Seattle, in addition to Downtown, Westside, and South Capitol locations in Olympia. (South Capitol was designed by Roussa Cassel ’05 and built by Pete Chramiec ’95). Year after year the company receives awards for best business practices and delicious coffee. Schroeder keeps his skills sharp by competing—and winning—in barista competitions. 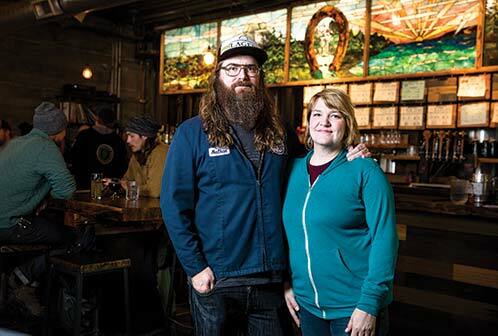 Another local gem included in Food & Wine was the cider-serving Teeny Tiny Taproom— a mini extension of Good Food award-winner Whitewood Cider—owned by Heather Ringwood ’01 and David White. You’ll find it tucked among the food trucks on 4th Avenue and Plum Street. At the Olympia Farmers Market you’ll see fermented delights from OlyKraut by Sash Sunday ’09. Other popular establishments include King Solomon’s Reef: Justin McIntyre ’08, Budd Bay Café: Pam Oates ’86, and The Mark: Lisa Owen ’92.